The tour starts from the elegant area in the north of the city. 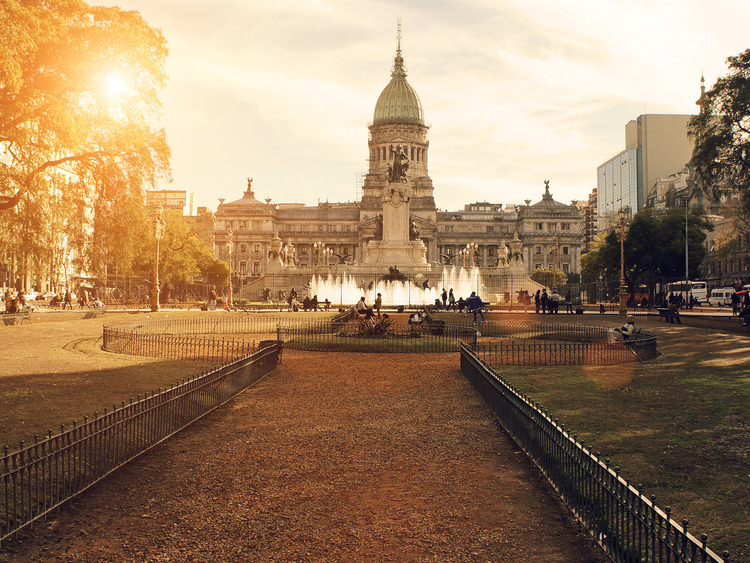 We visit the Palermo neighbourhood, the largest in Buenos Aires. With its elegant buildings, which are mostly embassies, consulates and museums, leafy roads, exclusive restaurants, pastry shops, clubs and shops, it has a truly unique elegant atmosphere. We admire the most interesting landmarks of this part of the city such as Parque 3 febrero, better known as "Bosques de Palermo", which covers 34,000 square metres and boasts a lovely rose garden, the botanical garden, the Galileo Galilei planetarium, the zoological garden, the Monument to the Magna Carta , the hippodrome and a huge golf course. We go on to Plaza de Mayo, one of the oldest places which is the cultural, political and historical heart of the city where we admire Casa Rosada, residence of the President of the Republic, the Cabildo, a fascinating colonial building which is now the National Museum of the May Revolution, the Pirámide de Mayo and the Baroque Metropolitan cathedral. We cross Plaza de la República, hub of the city, intersection between avenida Corrientes and avenida 9 de Julio and location of the Obelisk built to celebrate the fourth centenary of the founding of the city. We visit the exterior of Teatro Colón, a magnificent building and one of the largest opera houses in the world, then go for a short walk around San Telmo, one of the most characteristic neighbourhoods in Buenos Aires with narrow cobbled alleys, low buildings and countless antique shops that make it a truly charming place. We then arrive to the famous La Boca neighbourhood, the first port in Buenos Aires which grew into a blue collar neighbourhood, where most of the Italian and Spanish immigrants (mainly from Genoa) who arrived during the 19th century looking for fortune lived. The neighbourhood is characterised by coloured houses decorated with flags, statues and posters of Diego Armando Maradona. The most famous street of the neighbourhood is Caminito, flanked by houses painted in lively colours and stalls run by local artists and artisans.